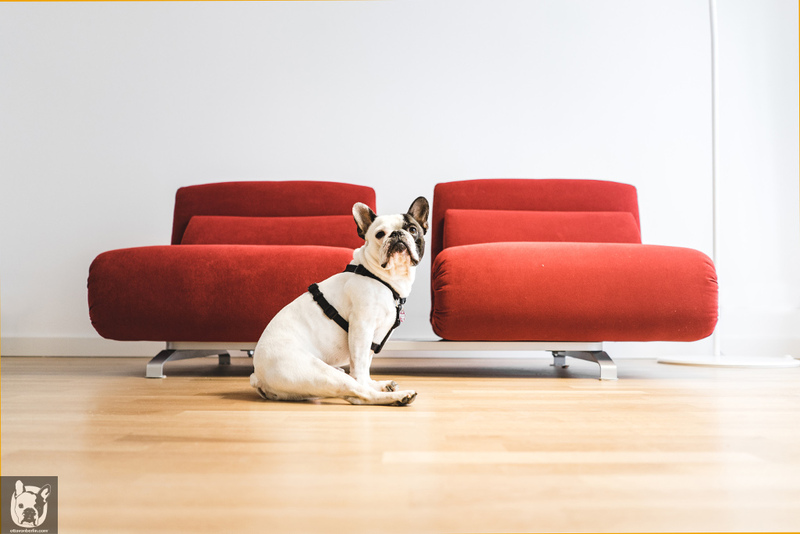 Hey folks, it’s me again; your favorite French bulldog, CE-Woof and creative director Otto from Otto von Berlin. This time, I want to introduce to you our newest project that we are working on – something very out of the box for us. 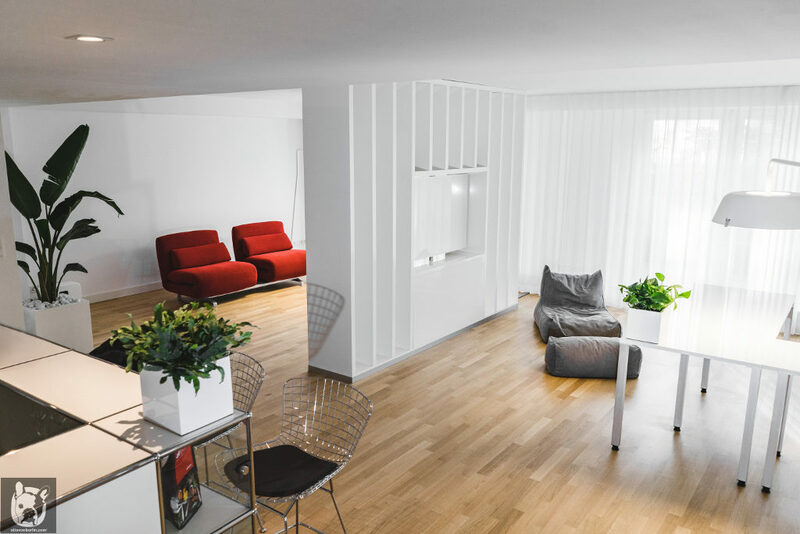 We are building a business apartment in Berlin-Grunewald made all in white (!). Completely different to our usual ‘Dark Scandinavian’ approach, but we like to expand our horizon as well. 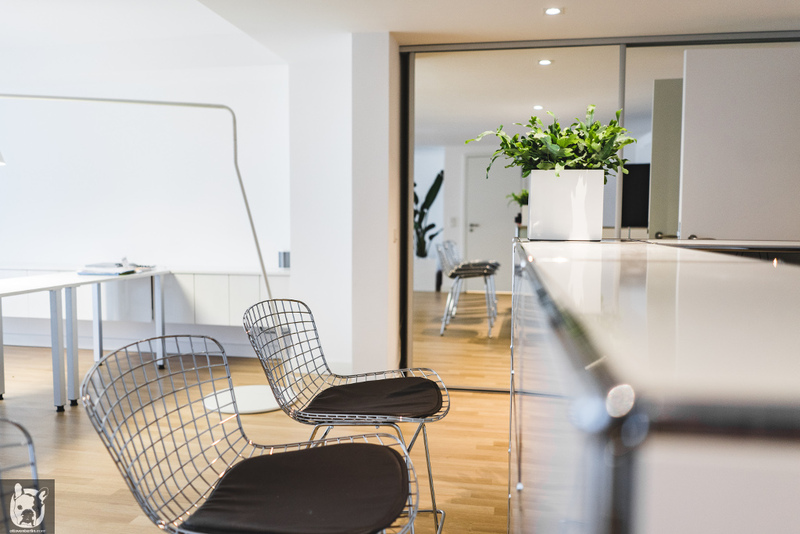 Find out how to make the most of your apartment and turn your home into a multi-functional working space. My owner Gregor Drobnic is reading a lot, to keep up with the ever-changing interior design trends. Just recently, he read an interesting article from the Business insider, where they were talking about interior design for smaller spaces. It’s interesting to know that about 50% of the world’s population live in cities and it will only increase as time goes by. But that means less room for everybody in cities, which means we all need to learn how to make our smaller space multi-functional. 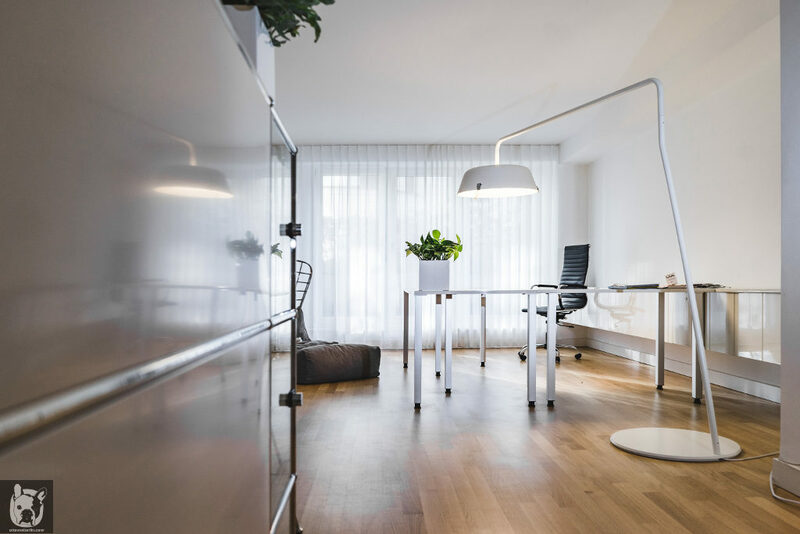 The living situation in Berlin is no difference – many of our clients are asking to design their apartments and make it more functional, so they can work from home potentially. 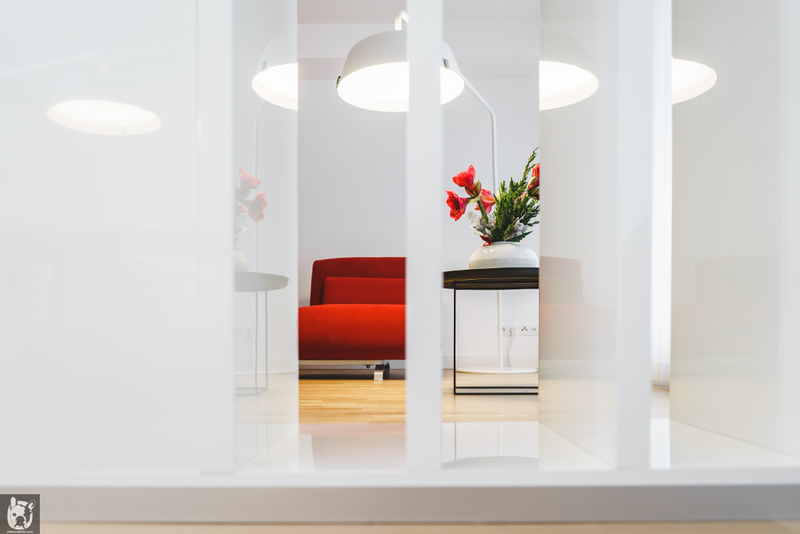 This is why we’d like to present you our newest project, a business apartment, and show you how to make the most of your space. The layout of this apartment is very intriguing to work with. Gregor had a look on the scale of the space, because that is something people tend to forget when laying out their apartments. We interior designer create renderings beforehand, 3-D visualizations of a room, before realizing it. Therefore, he divided the main room into two split spaces – the office section in the front of the room, closer to the door and a lounge area in the back of the room for business meetings. The cubic perspective of the space allows a direct view from the office onto the lounge area, without seeing the kitchen area. The room is split through a mobile media wall. That allows the person to open the room and make it one huge space, or split it into two areas. All the tables we implemented in this room are movable as well to make them more multifunctional – in case one has guests coming over or the kids need a drawing table for their masterpieces. The kitchen area in this business apartment has a long counter for guests to have lunch, allowing to have a 360-degree view on the whole space. On top of the counter, we implemented an extendable kitchen table with room for up to 10 guests. Just because this apartment is labeled as business, doesn’t mean one shouldn’t have the comfort of socializing with one’s friends. A tip for small spaces is to always figure out a way in which the pieces that you chose can have multiple purposes. 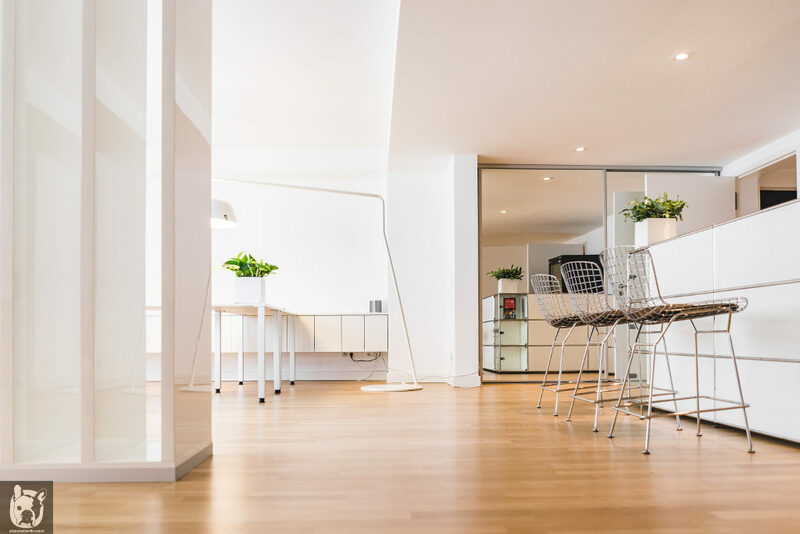 Not only the layout is important to think about before starting to design your home – it is very important to know how to work with the lighting inside your space. In our case we were very fortunate to have big windows in the space, allowing us to create a nice, vivid atmosphere. But for the evening time, we are implementing Vertigo lamps to create a relaxing ambient after a long home-office day. Functionality is the keyword if it comes to design small apartments. Storage room usually takes a lot of essential space away and on top of that it is usually a thorn in the eye most of the times. Therefore, Gregor made sure that all the storage spaces are hidden behind other interior objects. The mirror system in the entrance hall has hidden cabinets behind it, to have as little shown as possible. It creates at the same time a very clean, very ‘laboratory’ kind of atmosphere. Mirrors are the perfect objects to hide storage space behind. For the bathroom we did the same, taking a large mirror to not only create more storage room for toiletries, but also creating additional light sources. How does this work you ask? The mirror is reflecting the two hanging lamps we implemented inside this bathroom. So instead of two light sources, you gain four. Pretty smart, eh? That’s all for now, folks. Stay tuned for more helpful tips on interior design from our crew from Otto von Berlin.